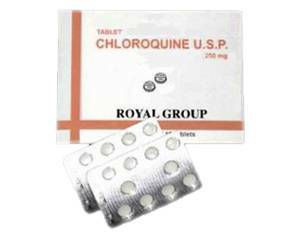 Chloroquine is an antimalarial medicine. The active ingredient chloroquine kills the parasites that cause malaria and also has anti-inflammatory activity. Chloroquine can be used both to prevent and to treat acute malaria. Chloroquine is a prescription-only medicine. Malaria is a serious disease that is widespread in tropical areas. Malaria is caused by a parasite and can spread to humans through the bites of infected mosquitoes. The infected person may have feverish attacks and a range of other symptoms such as cold tremors, vomiting, diarrhoea and joint pain. Chloroquine kills the parasite that causes malaria. Chloroquine also has anti-inflammatory activity and is sometimes used in high doses to treat rheumatoid arthritis and systemic lupus erythematosus. Chloroquine should be taken with a drink of water, either with or after food. To prevent malaria, you should take the tablets before travel to the malarious area. The tablets should be taken regularly every week throughout the stay and continued for at least four weeks after leaving the malarious area. Chloroquine can sometimes cause eye problems when used long term. For this reason, you should have an eye examination regularly if you are taking the medicine for an extended period of time or in high doses. Adults and children aged 13 years and above: 300 mg once a week, on the same day each week, starting one to two weeks before travel to the malarious area. If this is not possible, take 300 mg once a day starting two days before travel and continue the regular dosing schedule. The tablets should be taken regularly every week throughout the stay and continued for four to eight weeks after leaving the malarious area. Children aged 11 and 12 years: 250 mg according to the dosage regimen described above. Children aged 7 to 10 years: 150 mg according to the dosage regimen described above. Children aged 4 to 6 years: 100 mg according to the dosage regimen described above. Children up to 4 years weighing at least 10 kg: 50 mg according to the dosage regimen describe above. Chloroquine tablets are not suitable for use in children weighing less than 10 kg. The treatment of malaria, rheumatoid arthritis and systemic lupus erythematosus requires a different dose. Read the package leaflet before use. Visual disturbances such as temporary blurred vision. You have a condition called myasthenia gravis in which there is abnormal muscle weakness, or if you have eye problems affecting vision or the retina. Consult a doctor on the use of this medicine if you have a health condition that is not listed above. Chloroquine may interact with other medicines. The doctor will have a list of medicines that you should avoid mixing it with. Chloroquine should only be used after seeking medical advice from a doctor if you are pregnant or breastfeeding. You can participate in traffic without any risk while taking this medicine, provided your vision is not impaired. Chloroquine does not interact with alcohol.